Hot melt glue guns offer effortless precision and usability when applying adhesive to a multitude of surfaces. This guide will give you a concise overview of the TEC range of glue guns, stocked by Trade Only Flooring Supplies. This includes their various applications, and how they can be used to assist in the installation of flooring components. Strong drying: No thickness in the adhesive is lost during the drying process, so you can ensure a strong, firm hold when applied correctly. Quick to apply: Glue can be applied quickly and efficiently when using a glue gun thanks to the accurate and direct application. Easy disposal: Any excess adhesive from a hot glue gun is much easier to clear up than a solvent based adhesive. Should you use a heavy duty or regular glue gun? There are two main hot melt glue guns that we supply by TEC. These are the TEC 3400 Heavy Duty Glue Gun, and the TEC 810 Glue Gun. There are key differences you should be aware of when choosing your glue gun. This is the heavy-duty model, as the name suggests. This glue gun takes glue slugs, not sticks, and offers a higher output than the standard model. The TEC 3400 is ideal for use by serious on-site contractors who can expect high usage. The smaller, and cheaper, standard model takes glue sticks, which are available in batches of 5kg. The TEC 810 glue gun is better suited for residential use, where reliability and efficiency are required, without the heavy-duty usage. Always unplug the applicator if the glue gun is not going to be used for 40 minutes or more. Always wipe excess glue away from the nozzle. This should be done while the applicator is still hot – protective gloves should always be worn. Never lay the glue gun on its side. Use either the supplied bench mount or other kind of mount between uses. Never remove the nozzle from a cold applicator – this can damage the thread. Remove when warm. Again, always wear safety gloves. Most glue guns should be ready to use within 3-5 minutes of heating up. Spray glue guns will require around 10 minutes. At Trade Only Flooring Supplies, we are naturally most interested in practical, trade applications for flooring and other home improvement projects. The uses for the TEC range of hot glue guns doesn’t stop there though. Product assembly: Hot glue guns can be used to help assemble a wide range of products through joint fixing, mounting, and more. Packaging and sealing: Most supermarket cardboard cartons are closed and sealed using a hot glue gun of some kind – this can be useful in the home too. Labelling: Hot melt glue guns can be used to bond paper backed film to plastic (such as in plastic supermarket goods) – this is also commonly used for attaching paper notes to large packages. Shoe repair: Hot glue guns are commonly used in the shoemaking industry. They can also be used to re-bond insoles or other shoe components for repair. Book binding and repairs: Most books today are bound using a hot melt glue gun. Once again, a hot melt glue gun can also be used to re-attach a loose hardback spine. Installing ceramic tiles: This includes vertical tiles, which can be easily affixed thanks to the quick curing time of the adhesive. At Trade Only Flooring Supplies, our main area of interest is flooring and carpet fitting. This is one of the areas the TEC range of hot glue guns excels most. Thanks to the quick curing of hot melt glue gun adhesive, it is also really handy for laying tiles on vertical surfaces. Nailing down grippers may require more time and effort than you’d like. Fortunately, a hot melt glue gun can be used to install these effortlessly. Unlike construction glues, hot melt glue gun adhesive cures in around 5 minutes, speeding up your project significantly. In most cases, you would use approximately 1x8 inch stick for every 48 inches of gripper. Apply the glue evenly along the whole gripper, being careful not to apply excessive amounts, as these can be forced out from under the strip when pressed into the floor. Apply the glue to the gripper, not the floor, and make sure you have the strip in place within one minute of application, before the curing starts. Tip: Longer grippers can be more awkward to work with. If you are faced with laying a long strip, try cutting it carefully into smaller sections and fixing them down one at a time. Another key use for a heavy-duty glue gun in flooring installation is the fixing of flooring profiles and trims. Just like with carpet gripper, flooring profiles can be stuck down effortlessly and securely with a TEC hot melt glue gun, without the need for nails or screws. 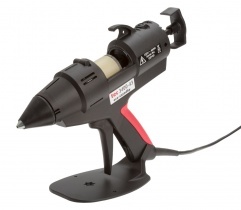 The TEC range of glue guns are especially useful for when you need a smaller gap filling with a quicker setting time. Here at Trade Only Flooring Supplies, we are happy to offer our expertise in all areas of flooring installation, maintenance and renovation. If you have any questions or require any assistance with any of the floor preparation tools we sell, please feel free to contact us and our team will be more than happy to help.